More about Paulig Presidentti Coffee and Fazer Milk Chocolate Gift Set Awaken your senses with the robust aroma of coffee and the sweet delight of Finnish chocolate with the Paulig Presidentti Coffee and Fazer Milk Chocolate Gift Set. Included in the pack is a large bag of Presidentti light roast coffee and two creamy bars of milk chocolate. Become the ultimate gift-giver this holiday season with this incredibly delicious gift pack! I love chocolate. I eat all kinds, but nothing compares to Fazer. It is mouth watering deliciousness. 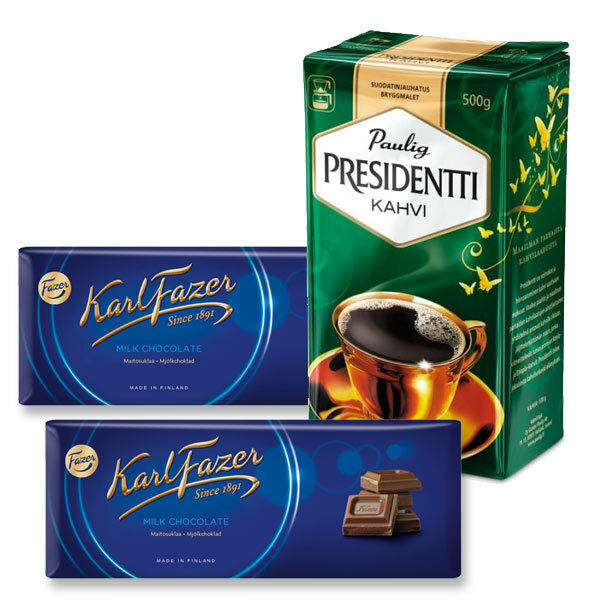 Presidentti coffee and Fazer chocolate are all time favorites and are fabulous together! Exceptionally nice gift set...it was well received! A perfect mix of flavors in the morning....the Presidentti coffee is strong...just the way we Finns like it....and the wonderful creamy Fazer chocolate is perfect. ProsHigh quality and good strong coffee...and true chocolate flavor and creaminess. Is the coffee whole bean or ground? thank you.